Prince Edward County’s purveyor of smoked pork and beef has something sweet cooking. 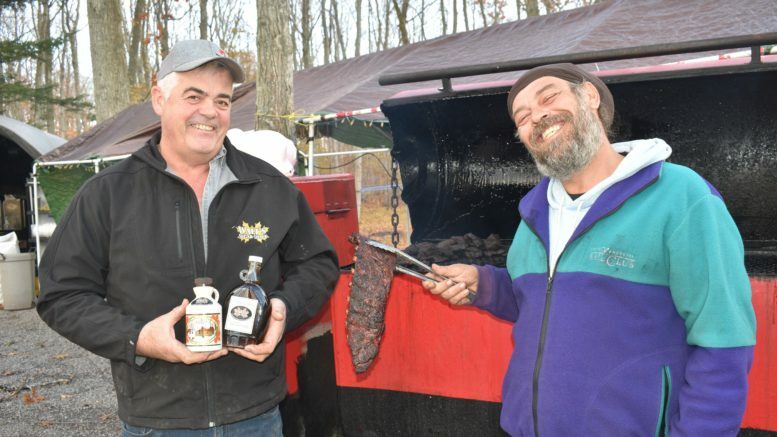 Ras Bingi will be braving this cold until Christmas time, selling smoked BBQ at Walt’s Sugar Shack at 1671 Salem Road in Ameliasburgh. Bingi has been using Brian Walt’s quality meats and maple syrup for his delicious creations all summer long and now, with the winter closing in, the smoked meat master is offering his delights at the shack. The Sugar Shack will be open on Saturdays from 12 p.m. to 6 p.m.
Ras Bingi’s maple pulled pork sandwiches are also available at the Belleville Farmer’s market on Tuesdays and Thursdays.